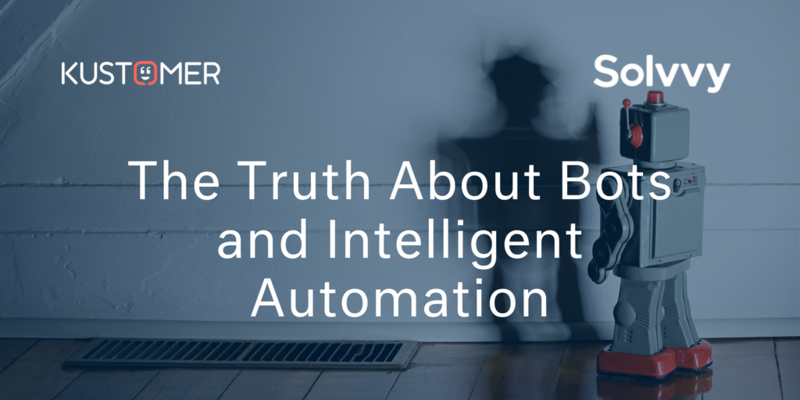 84% of the attendees of our recent webinar, The Truth About Bots and Intelligent Automation, consider Customer Experience Automation a priority for their strategy going forward. What options are available for the automation-minded company, and will a bot deliver amazing service AND make you breakfast? Well, not quite. We got to the bottom of these questions on air, and you can too from the recap below. Peter Johnson, Kustomer’s VP of Product, and Kaan Ersun, Solvvy’s SVP of Marketing, are both authorities on bots, automation, and using intelligent technologies for better service and support. They discussed the pros and cons of the solutions out there, and made some suggestions for picking and enabling more intelligent service. To level-set, PJ and Kaan laid out an overview of the terminology they’ll be using when discussing this complicated technology. While “intelligent” technologies have existed since Roman times, the term “Artificial Intelligence” came into use in the 1950s—though truly intelligent products just started becoming widely available over the last handful of years. Machine Learning is a more specific application, referring to the ability of machines to advance their program and “learn” from their mistakes without additional programming. A good example is the recent Google AI that beat a world champion at Go. Deep Learning is an even more advanced subset, describing computers that use algorithms that mimic the neural networks of the human brain—meaning they can learn on multiple levels without human supervision. Bots—Are They All They’re Cracked Up to Be? But how are these advancements being used on a practical level today? Bots are already taking on a variety of service and service-adjacent tasks within the enterprise, from Digital Marketing and DIY Service, to use cases involving virtual assistants. However, these experiments are still in their early stages. While they may help scale your service, they require a lot of effort to build, and lack customer understanding and the ability to deliver a quality, memorable experience. When you look at the cost and effort to build one versus the level of experience they provide, the math is a bit off. On top of that, they aren’t exactly plug-and-play. Service teams have to create replies for every possible input, and they need to be customized for the relevant terminology and details of your business. Actually integrating them with your existing data systems can be a headache, plus they need ongoing maintenance every time you add a new feature or product. Bots are a part of this strategy, but not the only focus. Instead, you can also use automation in conjunction with other integrations and platforms to create a stronger experience. Conversational forms look like a chat, but can be used to gather customer info and issues before handing off to a more capable agent to handle the issue. A system that automatically suggests responses to agents works the same as a bot, but uses the added layer of human oversight to learn the right way to respond by tracking your agents’ decisions. And automation is useful for suggesting tags, categorization, macros, helpbase articles, and assisting workflow and reporting—all things that can speed up your experience and make it more efficient, without directly interacting with customers. Kutomer and Solvvy work together to make conversational experience a reality. If you submit a question to Solvvy and can’t find the answer, you can choose to instantly open up a chat in Kustomer and get the answer. Kustomer’s conversational form then collects your personal information, then connects you with an agent who knows your whole customer history. If you’re taking a wide-angle approach and carefully planning your strategy, instead of leaping head first into messing around with a bot, your initiatives are much more likely to be a success. You can always watch the recording HERE, and for more great insights into service, experience, and technology, follow Solvvy and Kustomer.